Palyul Changchub Dargyeling - Washington DC Area, is solely supported by the generosity of donors. PCD-DC cannot exist without donations. In order to maintain our regular meditation classes and to host the Rinpoches of Palyul, PCD-DC humbly requests that you consider making a donation. The Book Club meets again on Wednesday, March 6th at Christine's house starting at 7:00. We'll be reading B. Alan Wallace’s Stilling the Mind. In this book, Wallace introduces us to Dudjom Lingpa's Vajra Essence, one of the most cherished works of the Nyingma school. Please help us plan by registering for this event. 4/8/2019: The 22nd annual Palyul Summer Retreat is now accepting registrations. This extraordinary gathering of Palyul teachers and students is not to be missed. The full retreat is from July 10 to Aug. 10; however, registration is available on a daily basis to fit your schedule. For more information, and to download a registration form, CLICK HERE. If you have more specific questions, please come to one of our meditation groups and have all your questions answered. 4/1/2019: Palyul Clear Light, the publishing branch of Palyul Ling International, is distributing its Spring 2019 Newsletter. In it you will find Heart Advice from His Holiness Pema Norbu Rinpoche, a calendar of important events, and much more. To view this newsletter in your browser CLICK HERE. 2/20/2019: Exciting news that helps sustain PCD-DC into the future. We changed our payment system so that we now accept credit cards for donations and event registration. Soon, we will be able to accept contributions onsite via Square. We cannot exist without your assistance. We rely on your generous donations to help us meet our expenses and provide for the wonderful teachers that visit us from time to time. Please consider being a regular contributor or make a one-time donation. 1/23/2019: Ven. Khenpo Kunsang Dechen Rinpoche’s teachings on the Heart Sutra last weekend were, shall we say, enlightening. Khen Rinpoche, in his first visit to PCD-DC, made fast friends with us all. His warmhearted good humor and profound understanding filled us with joy and inspiration. With our strong wish that we again may be blessed by his guidance in the future, we bid farewell to Khen Rinpoche as he leaves for our sister Sangha in Florida, Palyul Pensacola. May you travel safely, Rinpoche! Audio recordings from past teachings during special guest visits are available for download to members of PCD-DC. Become a member today! Khenchen Tsewang Gyatso Rinpoche's recordings are from his commentary on Kunhyen Jigme Lingpa's "Ladder to Akanishtha" on Sept 4-8, 2018 and his meditation class on Sep 9, 2018. Lopon Damchoe's recording is from her visit to PCD-DC on August 19, 2018. She comments on the Wheel of Analytical Meditation by Mipham Rinpoche. 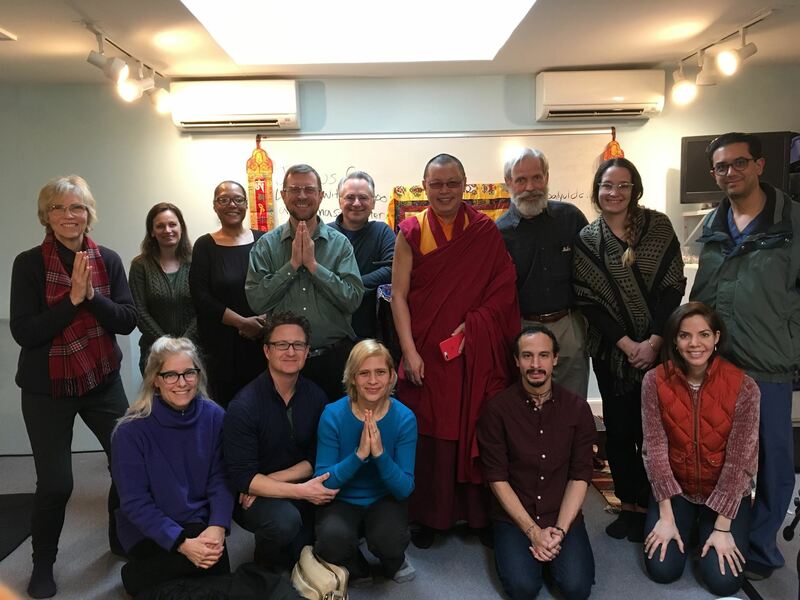 Khenpo Tenzin Norgay Rinpoche's recording is from his visit to PCD-DC on April 1, 2018. It is a traditional commentary on the Wheel of Analytical Meditation by the 19th century meditation master and celebrated scholar Jamgon Mipham Rinpoche. The Wheel has been used by PCD-DC as our study guide for the intermediate meditation classes. This teaching from Khenpo Norgay is an opportunity for students to receive these instructions from an official lineage holder of Mipham's wisdom.